Chloroform in the American pie. Beverley and I recently traded off a pair of albums to review. She received the impeccably corny bubblegum stylings of Aquarium by Aqua. 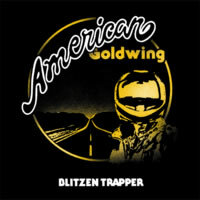 I, on the other hand, found myself ear-to-speaker with Blitzen Trapper's "American Goldwing". Beverley was lucky; her assigned listening was upbeat. Ridiculously silly at times, but certainly it had its playful merits. I ended up in the sonic equivalent of a smoky rural country bar with Toothless Joe laying facedown in his stale swill as a withered band crooned away in the corner below a flickering neon sign advertising a draft beer that hasn't existed in thirty years. Definitely not suitable music to keep a mildly drowsy character such as myself awake during that unfriendly early morning hour-long drive to work, Blitzen Trapper manages to use the "alternative country" genre to cause others to ask, "THIS is the only alternative?" In other words, the album was dry as a continent adult in the Mojave desert. You may be thinking already that I hate all country music and that any album of this nature would automatically receive a low grade. You would be wrong. There is attractive country music out there, and I'm sure it could be handed to me on a silver platter to my utter enjoyment. Blitzen Trapper, however, failed to deliver that work of art that stood out above the droningly average output of the Ford-truckin' community. Instead, every song they have produced on American Goldwing plays it safe, daring to wade within the levels of banality with a sound so generic, it has its own store brand label. There could have been shining moments, but melancholy strikes with an easy fist when you suddenly realize they actually have managed to subjectify "alternative country" and follow its specific blueprint when developing their works. The result? Boring music that could be used as literal textbook definitions of the genre, if there was such an incidence. Maybe I'm just being too hard on the album and on the Portland quintet of Blitzen Trapper. But listening to songs like Might Find It Cheap really makes my nose crinkle. This song could have been noble and original, had I not already heard the basic equivalent on a Rush Greatest Hits album, right down to the vocals. It's not a cover song, no, but there is a definite influence from relaxed rock of the 1970s. Unfortunately, the sound is stuck in that decade, stuck in that gritty tavern pseudo-environment. Perhaps this song is targeted more toward those who have maintained a faithful allegiance to the Americana music of olde. Frankly, the entire album swings that way: other tracks such as Fletcher, Your Crying Eyes, and indeed the title track, American Goldwing, all harken to the days when Lynyrd Skynyrd were spreading their sound. The final song, Stranger In A Strange Land, takes a slight detour to be more relaxed, bucking the trend of straightforward country in favour of a folksier facade, and it's a breath of fresh air after the long journey already taken. Just to make myself clear, I don't consider a link to the past to be musical heresy. But Blitzen Trapper appears to be following their flow, producing similar concepts that resonate more as an homage than an original work. They clearly are able to concoct coherent music, but it's far too much of a carbon copy of already infamized music from a previous era. Lyrically, they speak of mild adventure over whiskey consumption, but unless you're among the road-weary, it will be far more difficult to connect with the music on a personal level. Your enjoyment of American Goldwing will ultimately boil down to whether or not classic Americana still appeals to you. If so, this album will fit well into your library. Otherwise, you may be better off traveling up a different road. Besides, any band which requires three people to handle harmonica duties must be doing something in a topsy-turvy manner.